West Texas Intermediate (WTI); resistance point is 98point and support point is 83point. Our view in 06/08/2012 “West Texas Intermediate (WTI); if this may become true fall, the target price is 71point” has not changed. 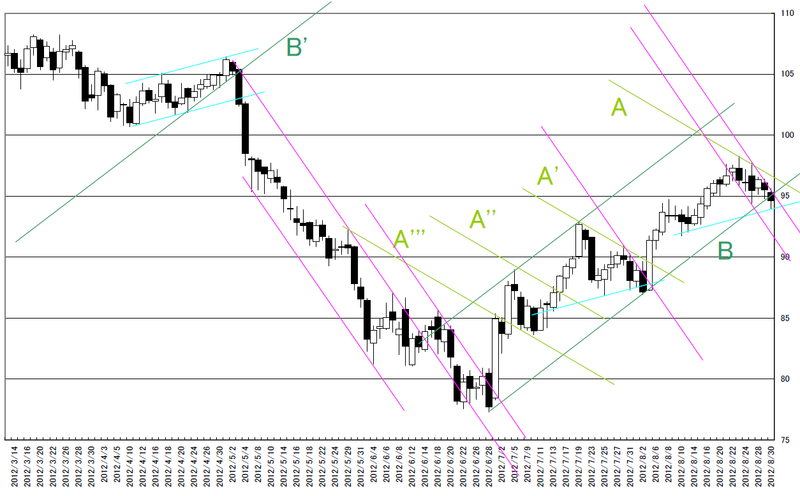 We need to watch the market price cut which direction of 45 degree resistance or support. 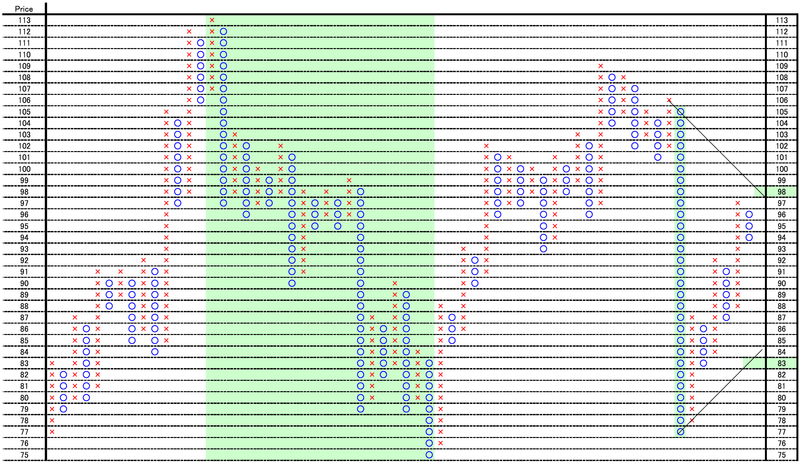 The latest upper side breaking point is 98point and down side is 83point. We added trend line on the chart. We colored same degree lines. We fell there are few cheats in this chart. 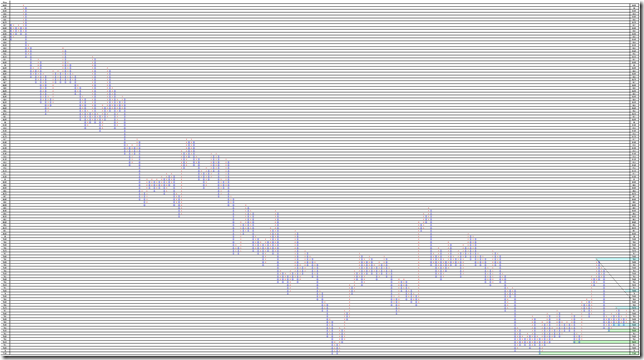 When the market price cut “A” linear series, they were the best point to take long position. There occurred 3times and we can not use this tactics. 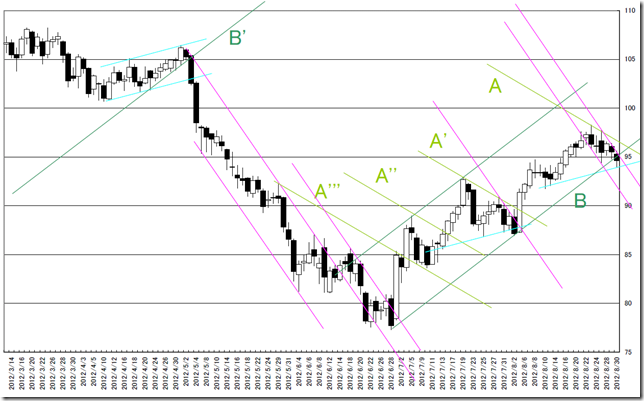 The most notice point is “B” linear series; last time, the market price fall there. If I have long position, I would close. The Light-blue line may works as support, but this may cheat. And pink line appeared; this may work as strong resistance point. Dollar/Yen; the upper side breaking is 79.60yen and the down side breaking is 77.50yen. Today’s analyze is Dollar/Yen rate. We reported “Long term USDJPY view. As aftertaste is bad; we think the market became bearish market.” in 06/06/2012 report. We think now is bear market until the weekend NY close price will go over 82.00yen. Our view in 08/14/2012 is not still change. 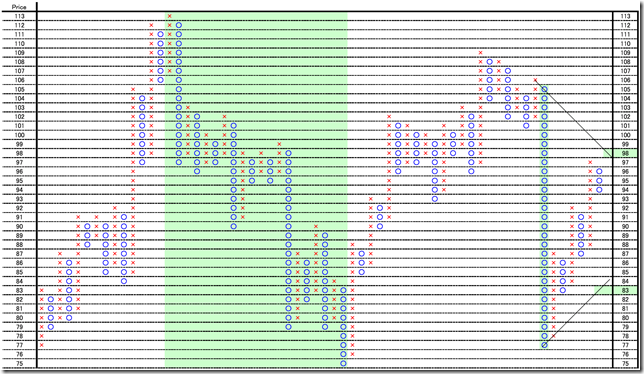 This is 0.5 price change and 3 box reversal close price’s Point and Figure chart. The upper side breaking point is 79.50yen and down side breaking point is 77.00yen. The upper side breaking point is 78.75yen, 79.05yen and 79.60yen. The down side breaking point is 78.45yen, 78.35yen, 78.15yen and 77.95yen. From these charts, we can see under these. If the market price will go over 79.05yen, 79.50-60yen will work as resistance point. If the market price will go over 79.50-60yen, this is upper side breaking. 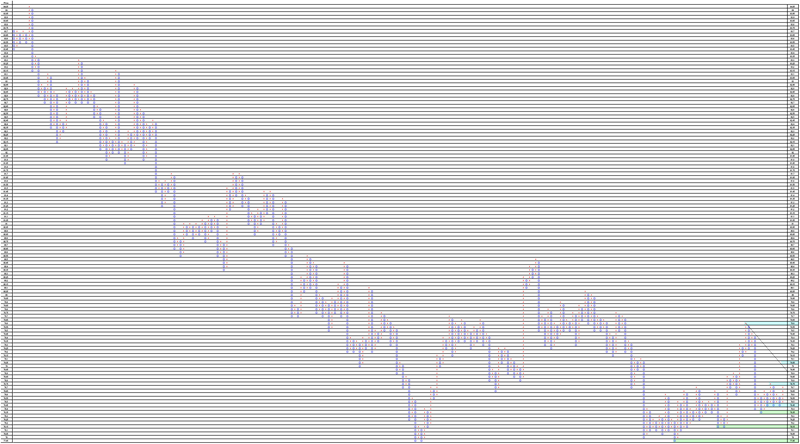 There are 4 resistance points under 78.45yen, and these resistance points will work. If the market price cut 77.95yen and does not cut 77.50yen, this is not the real down side breaking; the market price will be reversal. If the market price will cut 77.50yen, this is down side breaking. Our conclusion is “Waiting for the breaking”.